Young skin is thick, elastic, and has a uniform color. As we go through life, the color of the skin becomes uneven. The skin thins out and becomes far less elastic. It starts to sag, crease, and wrinkle. The skin aging process is complex and is caused by a combination of damage from sunlight and intrinsic changes in the cells due to ageing. When the skin is exposed to ultraviolet light, the cells in the skin respond by producing increased amounts of melanin. Melanin is a dark brown pigment that absorbs light and acts to protect the skin against ultraviolet light. A tan and, in some people, freckling, are common consequences of exposure to sunlight. However, both tans and freckles fade away after about 2 weeks because the cells with darker pigment are shed and replaced by new cells. Prolonged exposure to sunlight for years causes some cells to get stuck in permanent pigment-making mode. The result is an uneven complexion and the formation of dark spots, called liver spots, sunspots, or solar lentigos. Some studies indicate that an uneven complexion is one of the main ways people unconsciously judge other people’s ages, even more so than wrinkles and lines. In addition to affecting the complexion, ultraviolet light directly damages DNA. When a photon of UVB is absorbed by DNA, it directly causes thymine molecules to form into a dimer (1). Ultraviolet light can also damage DNA indirectly through the creation of free radicals. If the ultraviolet light is absorbed by proteins in the skin, bursts of free radicals that cause DNA damage occur (2). The cell can repair a limited amount of DNA damage, but if the damage is excessive, a normal cell will be triggered to undergo apoptosis through a p53 dependent pathway. In some cases the damage will be repaired incorrectly and the cell will mutate, possibly towards a cancerous state. Actually, exposure to UV seems to be responsible for 80% of skin ageing (3). Every 3 years, we can notice a 2% increase in damage. There are two main types of ultraviolet light, UVA and UVB. UVB is thought to play a major role in skin cancer and uneven complexions. UVA is thought to be the primary cause of wrinkles (2). 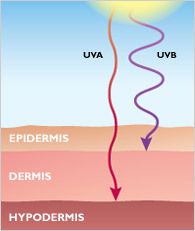 UVB only penetrates the epidermis. UVA penetrates more deeply, into the basal layers of the skin, where it acts to induce the activity of matrix metalloproteinases, which go to work breaking down collagen and elastin. Over time, this causes the skin to become thinner and less elastic, allowing it to sag, wrinkle, and crease. In addition, UVA causes skin cells to stop producing vitamin A receptors, which causes the skin cells to slow down reproduction. 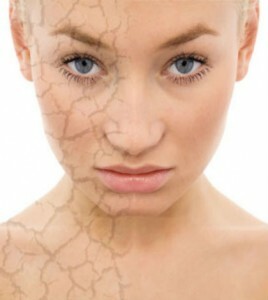 Fewer skin cells being made further thins and weakens the skin and also delays skin healing. When hairless mice are exposed to ultraviolet light, they experience sunburns. If they are chronically exposed to ultraviolet light, they develop wrinkles, sunspots, and sometimes skin cancer. A group of researchers recently reported that topical application of pterostilbene before ultraviolet exposure can powerfully protect against all of these effects (4). It had a quite remarkable ability to protect against skin cancer, with 90% of of mice being tumor-free at the end of the 40 week experiment as compared to mice treated with resveratrol or no treatment (0% tumor-free for both groups). Of course, pterostilbene is a well-known antioxidant, so it would be expected to provide some protection against skin cancer by preventing free radical-induced DNA damage. Indeed, the researchers found that the pterostilbene treated mice showed fewer signs of oxidative damage. This effect extended beyond simply mopping up free radicals-the pterostilbene treatment induced the up-regulation of other protective antioxidants, including glutathione, superoxide dismutase, and catalase. Normally, skin exposed to UVB experiences a decrease in these protective molecules, but pterostilbene treatment was able to prevent this from happening. Other natural antioxidant polyphenols, such as resveretrol and lutein, are unable to protect skin from ultraviolet light, suggesting the mechanism of action is unique to pterostilbene. Nrf2 is a master regulator of the expression of antioxidants and other genes in keratinocytes, the predominant type of cell in the skin. In a human skin culture model, application of pterostilbene to keratinocytes caused Nrf2 to translocate into the nucleus and induce expression of antioxidant molecules (Glutathion (GSH), Catalase (CAT) and Superoxide Dismutase (SOD)) and down-regulate other important molecules, such as NADPH quinone oxidoreductase (4). Altering the ratio of NDPH:NAD+ in cells by downregulating this enzyme can have a profound anti-aging effect on a wide variety of tissues. The most common types of skin cancer are carcinomas. They are very rarely fatal, but can be disfiguring. 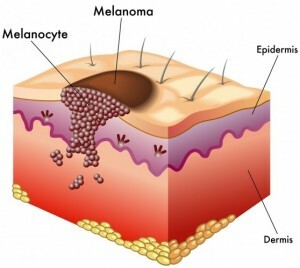 Melanoma, however, has a fairly high death rate due to its propensity to metastasize into the body. 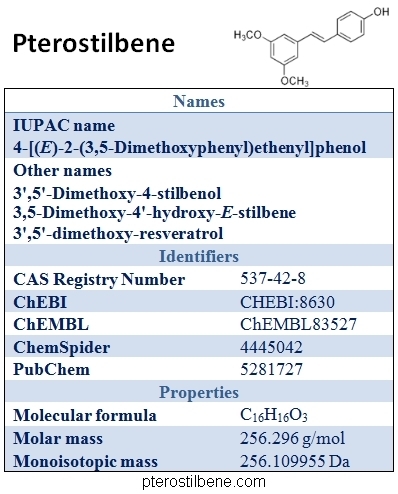 Other researchers have shown that pterostilbene can inhibit the growth of melanoma cells (5) and inhibit their ability to metastasize (6) suggesting that regularly applying pterostilbene to the skin may prevent melanomas from progressing to a deadly form, or perhaps even prevent them from forming at all. Hairless mice exposed to ultraviolet light develop all of the signs of aging seen in older people: wrinkles, sagging and thinning skin, uneven complexion and dark spots. As mentioned above, some of these effects are due to direct damage from the ultraviolet light and others are due to the inflammation and induction of proteins that degrade collagen and elastin. In the mouse study, pterostilbene was able to effectively prevent both inflammation and induction of matrix-degrading proteins, causing the mice to retain smooth, firm, elastic skin (4). No adverse events occurred in response to the topical application of pterostilbene to hairless mice. Their skin appeared to be healthy and un-irritated, even after weeks of regular application (4). The active molecule, delivered by liposomes, was readily absorbed into the skin within 20 minutes of application. The results of this ground-breaking study suggest that pterostilbene could be used as both a sunscreen to prevent skin cancer and as a way to prevent skin aging. 3. Clin Cosmet Investig Dermatol. 2013; 6: 221–232. 4. Free Radic Biol Med. 2015 Aug;85:1-11. doi: 10.1016/j.freeradbiomed.2015.03.027.Epub 2015 Apr 4. 5. Am J Surg. 2009 Nov;198(5):679-84. doi: 10.1016/j.amjsurg.2009.07.014.